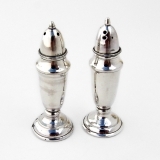 Japanese sterling silver salt and pepper shakers. These elegant shakers are 2 3/8" long, the shakers have screw on lids, the bases are weighted which makes the shakers very stable. 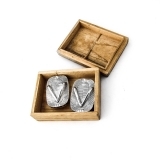 Japanese 950 sterling silver salt and pepper shakers in a form of flip flops or sandals. These darling shakers are 1 3/4" long, 1 1/8" wide and weigh a total of 30.7 grams. 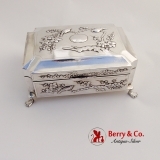 Antique Japanese Sterling Silver Humidor Box Bird and Cherry Blossom Designs c.1900. This beautiful box is 7 1/2" long, 5 3/8" wide, 3 1/4" tall. The box sits on four stylized lion paw feet. 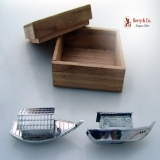 The box weighs 809 grams including the wooden lining. There are no monograms or removals, the box is in overall very good original condition. 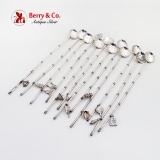 Japanese Iced Tea Spoons Set of 12 Flower Shaped Bowls, Bamboo Motif Straws & Figural Charms 950 Sterling Silver c. 1930. These spectacular spoons are 8 7/8" long. Total weight is 116.5 grams or 3.7 Ozs. Troy. 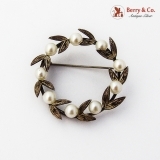 This beautiful brooch is 1 3/8" in diameter and weighs 5.6 grams. 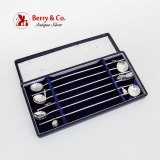 Japanese Iced Tea Sipper Spoons Boxed Set of 6, Flower Bowls, Bamboo Design Straws & Figural Charms 950 Sterling Silver. These spectacular spoons are 8 3/4" long. Total weight is 52.4 grams or 1.7 Ozs. Troy.